Arizona congressmen Andy Biggs and Paul Gosar joined Rep. Mark Meadows and Rep. Jim Jordan in introducing Articles of Impeachment against Deputy Attorney General Rod Rosenstein. Mr. Rosenstein’s Department is subject to constitutional checks and balances. I call on my colleagues to assert our constitutional responsibility and approve these articles of impeachment. According to Meadows, the impeachment articles come as evidence continues to mount regarding the Department of Justice’s problematic decision-making during the 2016 campaign and conduct surrounding the transition to President Trump’s administration in 2017. The impeachment articles are the result of nearly 9 months of unsuccessful Congressional attempts to force the Department of Justice (DOJ) to comply with oversight requests. “The DOJ is keeping information from Congress. Enough is enough. It’s time to hold Mr. Rosenstein accountable for blocking Congress’s constitutional oversight role,” said Rep. Jordan. “Congress gave Mr. Rosenstein plenty of time to comply with our requests. We have been reasonable and up front with him. Unfortunately, at almost every opportunity, Mr. Rosenstein has resisted and defied Congress’s constitutional oversight. His time to obstruct our investigations has expired,” said Biggs. this issue is not obstruction it’s a coup e’er-tat which is a type of revolution, where the illegal and overt seizure of a state by the military or other elites within the state apparatus occurs. This is exactly what we have happening since the election – this ‘resistance’ is the means being utilized to move the deep state to overthrow the election of the President. To change the course of the nation to a socialist globalist state. The fate of the nation as we know it is at hand. This action is beyond past due. Rod Rosenstein and “his”, not the public’s Department of Justice exemplifies why when a new president is elected that the appointees of the previous administration should resign or be removed. 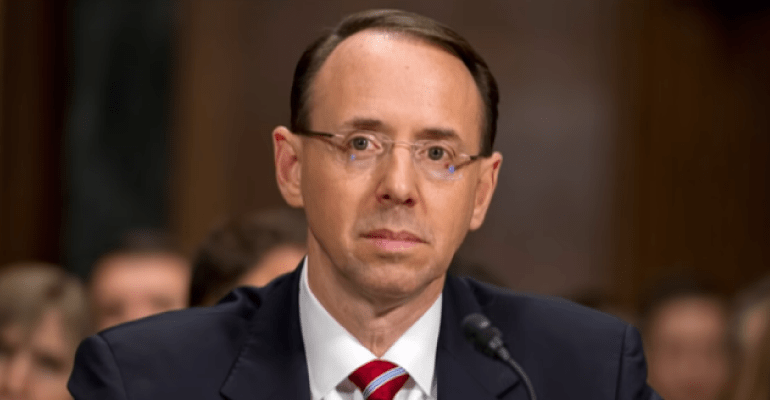 Rod Rosenstein is publicly displaying his party over people attitude, it’s time he left. The only 2 true representatives of the people we have elected in AZ. The rest are all McCain sycophants, open border, what’s in it for me seat warmers. Be careful for whom you vote in the primaries. NO to McSally & Lea Marquez-Peterson, (leftwinglea.com), who are both supported & funded by McCain, Flake, NRCC, C/C, global & open border $$$$. Kelli Ward & Brandon Martin both support our CITIZEN SELECTED & ELECTED PRESIDENT. Vote for them in the primaries. Gotta love Martha’s new radio ad, “the first women to fly fighter jets in combat” gee I was under the impression that the “A” in A-10 was for attack aircraft, I had no idea the Air Force was hiding F-10’s at DM. Martha can’t keep her lies straight so it’s impossible for her to ever tell the truth, next she’ll be boasting of dodging sniper fire in Kosovo. I know it’s election time but her use of the word “I” is starting to make her sound like Obama! Heidi is right, it is time for the voters to take back the GOP from the donors and their political puppets. Those puppets include, but are not limited to, Governor Ducey (which will be the next group of public employees that will engage in an illegal strike to force him and his lackeys in the legislature to spend OUR tax money on ill considered raises to bolster his re-election chances? ); Senator Flake who refused to “stand and fight” to keep his seat because he knows he cannot win because the voters have his number as an Obama Democrat; Senator McCain, who, in an effort to silence his political opponents, was the first to suggest the IRS illegally discriminate against conservative groups applying for non-profit status; Rep McSally who is running on a fake Trump agenda to replace Flake but who will be supporting Flake if he runs against President Trump in 2020; and Marquez-Peterson who refuses to engage with the media and debate Brandon Martin so she can hide how bad a campaigner she is until it is too late for the GOP to make a change. Let`s end this Arizona GOP puppet show and move forward in the knowledge that anyone will be an improvement on these political failures. It is extremely hard to punish Democrat politicians for crime – or even fire them. Ordinary citizens do not enjoy such privilege. One can only hope that the little weasel gets what is coming to him. Arrogant asses all in the deep state. They simply think that they are hold harmless from the legislative branch and their employers the voters of this country. How utterly arrogant. Typical government workers.